These days, Kanye West is all about collaborations. In addition to preparing an album with Jay-Z, Ye has released tracks through his G.O.O.D. Fridays campaign that feature Bon Iver, Nicki Minaj, Pusha T and many more. 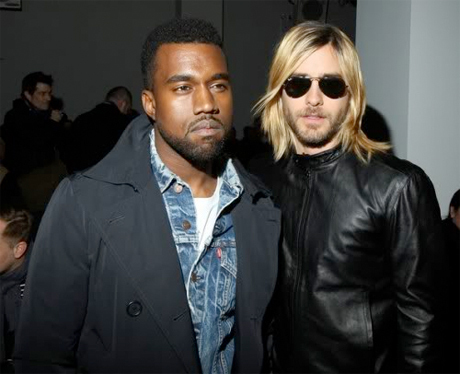 This latest collaboration, however, might be the most surprising of the bunch -- yesterday (November 7), Kanye appeared on stage at the MTV Europe Music Awards with Jared Leto's 30 Seconds to Mars. Kanye guested on the dramatic piano rocker "Hurricane." If you're having trouble sitting through Leto's overwrought crooning and white-zipper-covered pants, you might want to skip ahead to around the 3:05 mark, when Kanye comes on stage to deliver a Auto-Tuned verse followed by his own "Power."